I hope this information will be helpful to anyone unsure about decisions related to purchasing a typewriter. 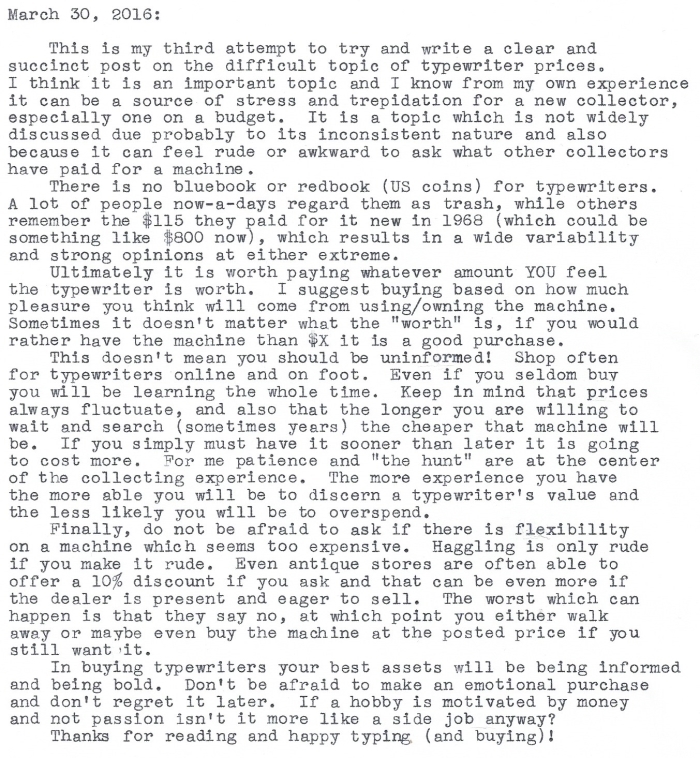 Learning how to buy typewriters is a process just as anything is, but with the right attitude I think it can be pretty straight-forward and simple. I would add that the closest thing to a "blue book" is the record of sold (not just completed) typewriter auctions on eBay. They reflect the points where supply and demand have coincided. Of course, you have to take into account the condiiton of the machine offered, and there will always be a range of values. Indeed. eBay watching is how I first learned prices. There is also a book Herman showed me and Peter reminded me off which has values in it but the book is dated and I think it is only high end machines. I think it would be pointless to try to make a current "blue book" for more common machines. Even just looking through eBay one can see quickly passing trends. Even with all my experience I still struggle estimating the value of a typewriter! I would also point out that, like most things, your area or region can play into pricing. I know that if I go to Lexington I am likely to pay more because there's a dealer in that city who buys up the cheap ones to restore. Unless it's a Selectric, which I can get cheaper because there are so many in that area. For some reason the Ann Arbor area has yielded cheap machines in good condition for me. Look around for areas like that especially if you are like me and have friends all over the country who are willing to pick them up and hold them for you. Different types of stores have yielded better pricing for me too. A flea market as opposed to an antique store. Also, leave your card at antique stores who turn away typewriters due to space issues. I get that a LOT. The store is often willing to give your card to someone in order to be helpful after turning down the typewriter. It's good customer service for them. I really enjoyed this post. And I totally agree that something is worth it if you get enjoyment out of it. Very true. Leaving a card is another technique I often use. In fact I need to get more printed up. I am geographically advantaged down here but the flipside is that areas with more money historically also happen to have nicer machines, even if they are more expensive today. AND machines can vary in rarity geographically based on the history of local dealerships. For example, RC Allens are rare as can be HERE but the Davis brothers say they are a dime a dozen where they used to buy. Well said. I lament the passing of the under $25.00 typewriters. I still remember my first from Happy's Flea Market in Roanoke, an Olivetti Praxis 48 for $5.00. My collection sure would be smaller at today's prices though. I really enjoyed this post. I have been collecting for a year and have learned a lot about prices (and can always learn more). My advice is that there are common typewriters that can be had for decent prices that are loads of fun like the Remington #1 Portable or the 1950's Remington Quiet-Riters. You might see these machines for around $100 but you can also find them for $30 if you look around. Great advice, and the best advice is that prices are just all over the place. I mean, picking up a minty Triumph for $10 just a few months ago convinces me that the $10 typewriter is still a thing, as long as you're patient and persistent. If I'd had a yearn to own one on my own timetable, it would surely have set me back $100 or more. It took me many years to realize that the range in prices that people charge for typewriters is mostly subjective. My general association with typewriter purchases began in 1999. The first typewriter I bought (an Underwood Leader) was $20. My roommate then decided he wanted one too. We went to some antique shops and found two large desktop models (and Underwood Rhythm Touch & a Royal model 10). The Underwood seemed to work the best so he settled on that...but the shopkeeper, seeing our interest, offered us both of them for $15. They had been in the shop for a while and He was tired of moving them around. So my first general insight about typewriter prices was thus: Portables are more expensive than desktops. Then I found an Underwood Universal with glass keys and it was priced at $40.00. At the time I thought that was high. It was twice the price of my other Underwood. I couldn't rationalize purchasing it (not with all the starving children in the world). Yet, after a few days, I went back and bought it thinking it would make a fine gift for my then girlfriend. She liked it about as much as a bowling ball and so it became mine. Actually, it then became my main typewriter and in truth it was so much better than my leader (however, I later gave that typer away after that gal & I broke up - typing on it reminded me too much of her). The next typewriter I found was such an accidental delight. The small case threw me off & had I not been looking for a clarinet for a fiend I might have missed it. It wound up being a folding Corona. It was priced $10.00. What a wonderful little machine. Yet at the time I had no idea how lucky I was. Then, a few weeks later, I found another one. However, this one was priced $100. The gears started spinning in my poor college kid brain. Could a typewriter be worth that much money? At that point in my life I had been on Ebay for about a year in order to buy and sell LP's. It never occurred to me to see if people were selling typewriters on there (it was a relatively new site at the time). So I looked up "Folding Corona" and was astonished to see prices from $100 to $200. As much as I liked the little bugger I was pretty excited about the idea of making a large profit off of such a small investment. So I sold it (I think I made $150). Then I started looking at some of the other typewriters listed. Right away I was startled by the shipping prices. Every typewriter I had ever bought was less than the cost to ship most of the ones listed. The Folding Corona is light & did not cost much, but most of the regular portables were $20-$50 to ship (which is not to mention the actual cost of the winning bid). Quickly I decided not to shop for typewriters online. They were something to be found "in the wild." That was that. I've never seen a HERMES in person...so it is tempting to click & type a few things online and pay close to $200 to have one delivered to my door....but then I see someone on the Facebook page who just came home from the thrift store with one for $10.00. In the end what I truly enjoy is the search--which can last years for a particular machine--as Mark pointed out. In that realm there is no fixed price...just the subjective whim of a seller who either knows something about typewriter or doesn't. I think the general online price for any given machine is the price for those who dwell in the world of immediacy. The "Blue Book" price is the "now" price. Anyone can get it for that price. One can buy almost any type of typewriter as quick and easy as one sends a text (save for the extremely rare examples). In closing (thank goodness) I will suggest that there are two distinct worlds of pricing: the online & the real world. The real world is of course influenced by the online world, but it is not necessarily influenced by it...and it is within that uninfluenced world where I prefer to buy my typewriters. Great comment! I do a fair bit of hunting online but only if I can get things cheaply. I bought a Rex Visible labeled as a Remington (by the seller) for a starting bid around $5 recently, so it happens but it's rare. Real world is more fun.